New Zealand appears in a very embryonic form as a single landmass with no western shore. 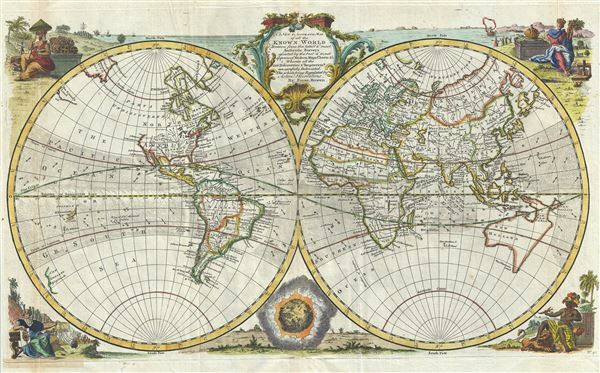 This most likely conforms to Abel Tasman's 1642 sighting of the western coast of South Island. Several hundred miles to the northeast of New Zealand a smaller group of islands is labeled 'Land and islands discovered by Quiros.' Pedro Fernandez di Quir was a Spanish explorer and religious zealot. Secretive, self-delusional, fanatical, and inept, Quiros made charts that bordered on fictional. It took several hundred years and no less a navigator than James Cook to finally figure out exactly what Quiros actually discovered. Very good. Minor wear and toning along original fold lines. Minor spotting. Original platemark visible.